Latest: Our 2019 season has got underway with two fabulous concerts at St Mary’s Church, Shenley Church End MK and St Mary’s Church Little Houghton where we sang to an amazing packed audience. Read the testimonial here! Our next performance is on 27th April at St Botolph’s Church, Church Brampton. 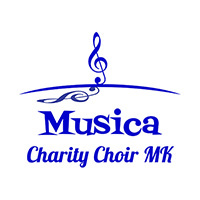 We are a choir based in Milton Keynes, currently with 20 voices, that performs for free apart from a modest fee for our accompanist. We take great pride and joy in performing at a high standard to raise money for worthy causes. The choir performs a mixed programme, singing very varied music so there’s something for everyone from well known stage and screen melodies, folk songs, spirituals, church music, pop songs and classics. Click on the MUSICA CELEBRATION tab to hear some samples of us in concert. Choir items are interspersed with solo, duet or quartet performances from our singers and we always feature our very talented accompanist. We can involve the audience too if requested, particularly at Christmas. We perform mainly in and around Milton Keynes and Northamptonshire but can consider other areas too. Check out our Future and Past Concert pages. We will perform for any charity or organisation working for a charitable cause or willing to donate to a charity for our services. This includes concert evenings, functions, events, weddings etc. Click here for details of funds raised! Simply contact to negotiate a date, time, place and programme. Please note that due to popularity and high demand we have no concert dates left for 2019. We are taking preliminary enquiries for 2020. Click here to contact us. We produce a programme for you to print. You book the venue, print the programmes, organise the advertising, arrangements for the evening, refreshments, raffle etc. We come and perform and you collect a worthy profit for your charity. We are keen to work together with organisations to support advertising and promotion. We already have a number of confirmed bookings for 2019, don’t hesitate, a limited number of concert opportunities still remain. We are available to hire for weddings, funerals and functions. You can make an enquiry through our contact page. Click here to go directly to the contact page.